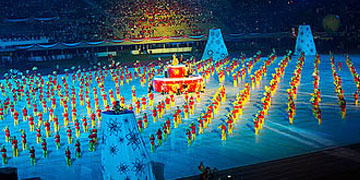 Back in 2003-2006, before Singapore’s National Day Parade was moved to The Float at Marina Bay, tarpaulin was needed as flooring for the performers. We supplied tarpaulin sheets which had extreme.. .
Back in 2003-2006, before Singapore’s National Day Parade was moved to The Float at Marina Bay, tarpaulin was needed as flooring for the performers. We supplied tarpaulin sheets which had extremely high tensile and tearing. These were able to withstand 13 float vehicles at a weight of 5 tons each and 4000 performers at any time. We are proud to have received the Certificate of Appreciation by the Minister of Defence. One of our contractors working on the Infineon project called on us to help with repair and alteration works for their canvas. We supplied the workmanship to re-weld and alter the fabric to correctly .. .
One of our contractors working on the Infineon project called on us to help with repair and alteration works for their canvas. We supplied the workmanship to re-weld and alter the fabric to correctly fit the building’s architecture. 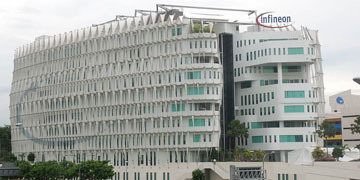 We supplied Singapore’s civil defence force with tarpaulin for use as temporary shelters. We have also donated around 200 tarpaulin tentage supplies to charity organizations... .
We supplied Singapore’s civil defence force with tarpaulin for use as temporary shelters. 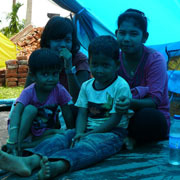 We have also donated around 200 tarpaulin tentage supplies to charity organizations.